Hello Stampers! The weekend is here. We are going to be catching some fun movies and of course it's Father's Day weekend so here is my final masculine card. I got these cute Rag Tag Animals stamps from Maya Road and I thought they would make a cute masculine card. I stamped this little guy in using chocolate ink and I couldn't leave the layout alone so off I go and did some sewing around the edges of the papers. I wanted to give the card some texture. I did pop up the image using 3-D foam tape. Fabulous creation! Love all the stitching and piercing! Thanks so much for joining us at The Sisterhood ‘One For The Boy’s’ challenge and please come back again soon! Fun card!! Your stitching is great!! This is so pretty! Looove the DP and the card layout. The image is so cute! Thanks for joining us at Loves Rubberstamps this week! Oh my adorable! The stitching was the perfect addition. Thanks so much for playing with us at Tuesday Morning Sketches this week! The bear is so cute, and i too, like the stitching you added! 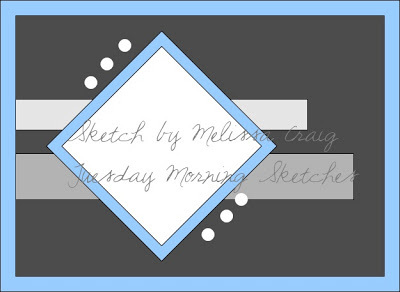 Thanks so much for using our sketch at Tuesday Morning Sketches! The stitching really sets off the card! Very cute! Thanks for playing with us at Loves Rubberstamps! What a great masculine card!! Such a sweet teddy. Great stitching. Thanks for sharing with us at ODBD!! I am sure the recipient will feel blessed to receive it!! Too cute! Love the stitching. Thanks for joining us at Tuesday Morning Sketches.